Mandate launched the ‘Decency for Dunnes Workers Campaign at the unions Biennial Delegate Conference in Killarney. 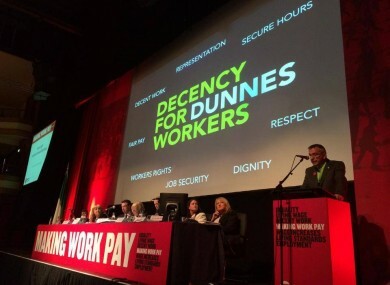 Launching of the Decency for Dunnes Workers Campaign at Mandate's Biennial Delegate Conference in Killarney, Co. Kerry. MANDATE TRADE UNION has hit out at supermarket retailer Dunnes Stores over its alleged use of workers contracts that are lower than 15 hours a week. Launching a campaign yesterday for workers’ rights within the company, the union said that the company entered a national agreement with Mandate in 1996 that guaranteed workers would be offered contracts for over 15 hours per week or more. “It is simply unacceptable to enter into an agreement with your staff only to walk away from it without any explanation. We want the company to implement the terms of the 1996 agreement with immediate effect and allow our members the right to representation that they are entitled to,” said Mandate Assistant General Secretary Gerry Light. Mandate, which represents more than 4,000 workers in Dunnes Stores, said the campaign – ‘Decency for Dunnes Workers Campaign ‘ – is being launched in order to tackle Dunnes workers rights nationally and to bring employment conditions in line with the company’s major competitors in the retail sector. The union alleges that the supermarket chain is now offering contracts lower than the agreed 15 hours, as well as having a multitude of pay rates for staff and the use of temporary and fixed-term contracts. There has been a dramatic increase in precarious work across the Irish retail sector and we have serious concerns based on feedback from our members that the employment standards in Dunnes Stores have deteriorated in recent years. Our members are demanding that the company address their key issues of concern. In this context, the union will be lodging a substantial claim with the company in the immediate future addressing all of the pertinent issues including a claim for a pay increase. Speaking to TheJournal.ie, a spokesperson for the union said the Dunnes will not engage with them in any way, despite numerous attempts. Mandate state that Dunnes Stores “is the most successful Irish owned retailer” employing 14,000 workers across 116 stores in the Republic of Ireland. Therefore, Mandate said they believe the campaign is an important step in the fight for decent work in the Irish retail sector. They have four key demands from the retailer; decent working hours, job security, fair pay and the right to union representation. Light said Mandate would work to secure banded hour contracts for Dunnes workers, similar to those that workers have in Tesco, Supervalu and Penneys. Attempts were made to contact a representative from Dunnes Stores, however no reply was received prior to publication. Email “Union hits out at Dunnes over workers' contracts lower than 15 hours per week”. Feedback on “Union hits out at Dunnes over workers' contracts lower than 15 hours per week”.